Feb.12 departed T.O. 6:30 for Belize via Delta Air. Changed planes in Atlanta and arrived at the Goldson International Airport outside of Belize City at 12:15 Belize Time. Though we have visited Belize many times before, the heat and humidity shrouded us and left us breathless as soon as we exited the plane. We checked out the Duty Free, loaded up on wine, cleared Customs and were greeted outside by Danielia Anderson, a young woman from San Ignacio who spent some time in the States and knows her way around both worlds. She and her mother, Tosh, run a shuttle service out of San Ignacio and will pick up and deliver any where in Belize. Danielia was good company on the 2 hour trip to the Aguada Hotel. Informed, personal and articulate, she caught us up to date on what we had missed since the last visit. A cautious driver, she takes great pride in her driving ability and cherishs the fact that she is the only female taxi driver in San Ignacio except for her mother who led the way, set up the business and hired her daughter. 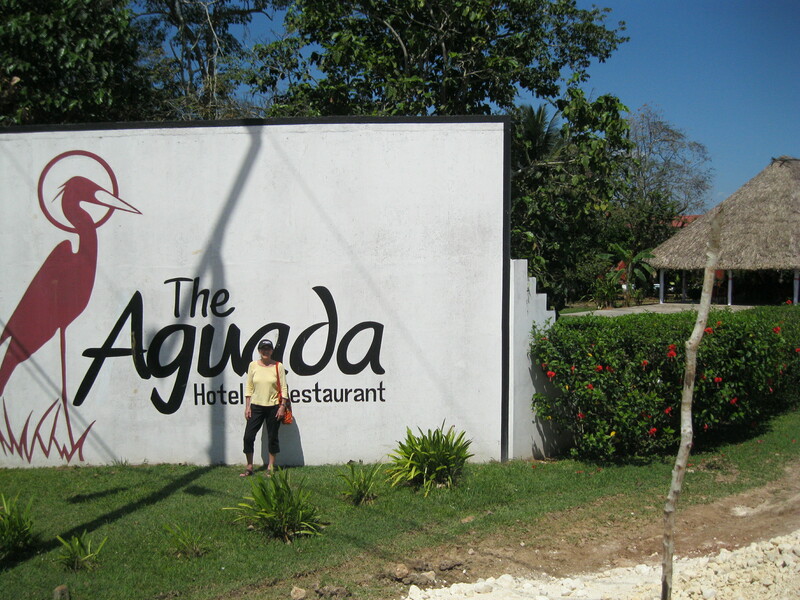 At the Aguada Hotel, Shalue, the owner/manager and her staff welcomed us back and made us feel comfortable and at home. That’s one of the pluses of visiting the same place over and over again. The minus is you miss experiencing what other places offer. We made our choice a long time ago. Dog-tired, we dropped our suitcase and backpacks in our cabana and went to sit under a palapa next to the restaurant. There we nibbled on nachos and salsa while drinking Belikin beer. As the sun set and the aguada (watering hole) we had been watching disappeared into darkness outside lights were turned on, illuminating the courtyard and the swimming pool adjacent to the palapa. Tall nameless trees strangely visible in the darkness of night stretched far upwards. A slight breeze riffled through the palm trees, their large leaves fanning the night air. And then came the exhilaration that travellers feel when they resume the adventure they had been forced by mundane circumstances to abandon. Then we stumbled and tumbled into bed, sleeping the sleep of the dead till song birds and crazy cackling grackles awoke us in the morning. I’ve written a lot about the Aguada in past blogs. 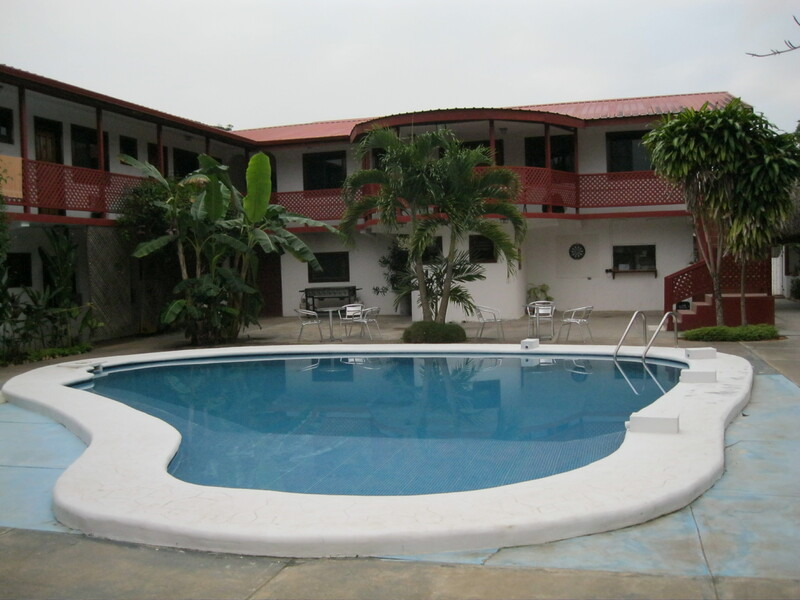 Check out Inland Adventure 1: San Ignacio for descriptive details. If anything, the Aguada is in better shape now than maybe ever. Shalue’s dad, Bill, passed on ownership to her about a year ago. I think Bill sensed the hotel needed an infusion of new energy. Shalue has more than met his expectations. We like to lounge around the hotel for large parts of the day, After breakfast we will go for a walk, do a bit of grocery shopping, come back for lunch, take a dip in the swimming pool, tan a little, snooze (me) and read (Evelyn) under the fan in our cabana, stepping out from time to sit on the cottage chairs facing the aguada. The aguada at the Aguada is a life-force of its own. Years ago it was where ranchers brought their cattle to drink. It is filled with an astonishing variety of fish and many turtles and ringed on the shoreline by white and yellow water lilies. Blue herons patrol the aguada, not to protect its species but to devour them. The large trees that surround the aguada nest many birds, not including, unfortunately some of Belize’s most exotic birds such as parrot, toucans and scarlet macaws. These birds left town a long time ago to seek sanctuary in the wilds of the rain forest and the Maya Mountains. Most interesting from our vantage on the porch is watching the iguana. 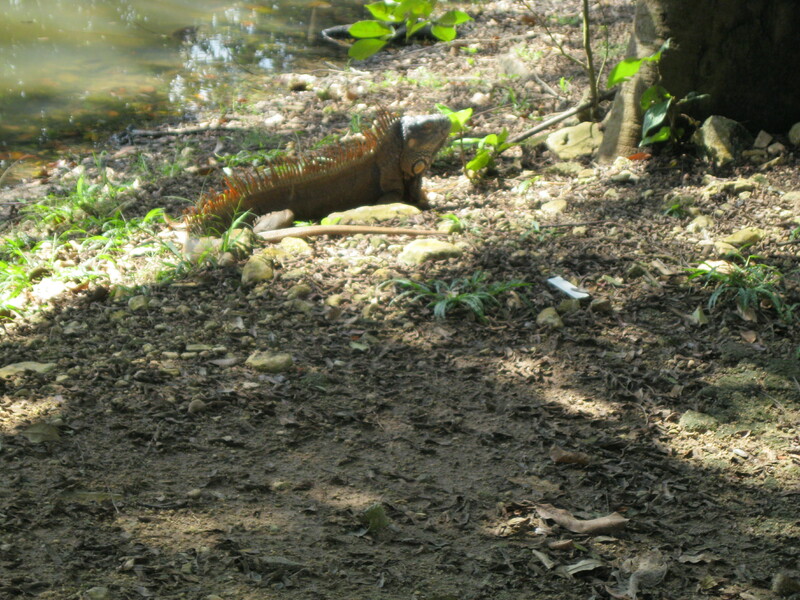 On a hot day in the trees closest to our cabana we have counted 12 iguanas, young and old, big and small, guys and girls. The trunks of the tree are only 3 metres away but they shoot up tall and the foliage on the branches increases as the iguana climbs upwards, which makes iguana watching a challenge worthy of a stiff drink when the day is done. On the other side of the aguada, we spotted the King of the Iguanas running about on land between trees, copper-coloured, bristle-backed, surveying his Kingdom with a mien of historic ferocity. We also fished the aguada with the Vasquez brothers, Chris 13, Peter 12, Tyrone 11, and Brian 8. They line-fished, using a rock for a sinker and flour and water mixed into a ball as bait. After fishing we shared plates of Nachos Supreme full of ground beef, melted cheese, hot jalapeo peppers all mixed with crisp nachos for scooping. 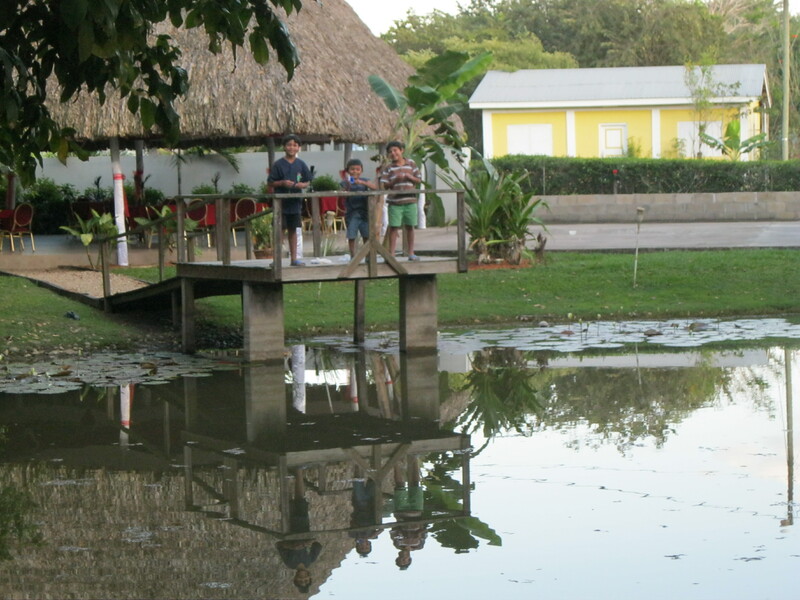 Around the pool, in the restaurants, and on the verandah we met many new travellers and local Belizeas. The days slipped by so easily it came as a shock to realize we had run out of time and had to move on. 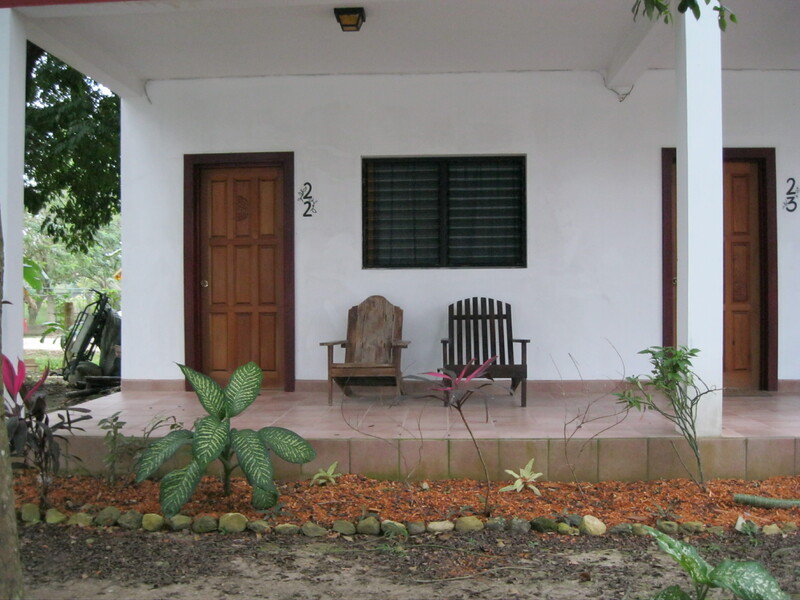 On my next blog, I will take you downtown in San Ignacio, describe our bus trip to Hopkins Village and introduce you to Greg and Rita, our hosts at the Hopkins Inn. This entry was posted on Saturday, July 13th, 2013 at 9:27 am	and posted in adventure, Travel. You can follow any responses to this entry through the RSS 2.0 feed.